Amsterdam has a number of bookstores selling English books. There are actually 4 dedicated English language book shops in the city whilst some Dutch bookstores also stock a range of English titles. Both US and UK published books are well represented – however you will pay a local premium over the usual dollar or pound cover price for new books. The Dutch book market is strictly regulated and in general prices tend to be quite high. There are a number of bookshops located around the Spui square area – a weekly book market is also held there every Friday. ABC is an Amsterdam institution, having been set up as a bargain bookstore in 1972 by two Americans. For years it was located on the Kalverstraat shopping street – however since 2006 it has made its home on the picturesque Spui square. Still a fiercely independent, family-run business, the current store is spread over 3 floors with a huge selection of American and British titles. 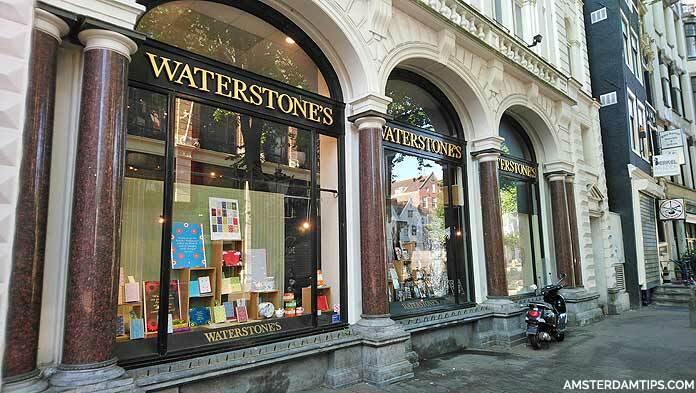 It claims to be the best stocked English language bookstore in continental Europe. The ground floor houses sections on art & design, fashion, music, photography, sport and a good selection of British and US magazines. Check out the tree trunk on display which goes up through the ceiling to the first floor. Head upstairs past the Bookwall – a large curved floor-to-ceiling shelf space filled with books – here you will find the travel section. The first floor has a comprehensive selection of sci-fi/fantasy books, cooking, gardening plus a children’s corner. The second floor covers history, politics, business and science. The White Room at the front has an excellent section on health, psychology, conspiracy and spiritual books. ABC has an Espresso Book Machine which allows you to print out your own self-published book. You will find the staff at ABC to be enthusiastic and knowledgeable. ABC gives a 10% discount to students, teachers and over 65s. Those over 55 get the discount on Mondays only by showing a valid ID. Anyone else can buy a yearly ABC card for €7 which also gives you the 10% discount. Regular social events such as book readings and open-mike nights are held. Open daily: Mon (1200-2000), Tue-Sat (1000-2000), Sun (1100-1830). 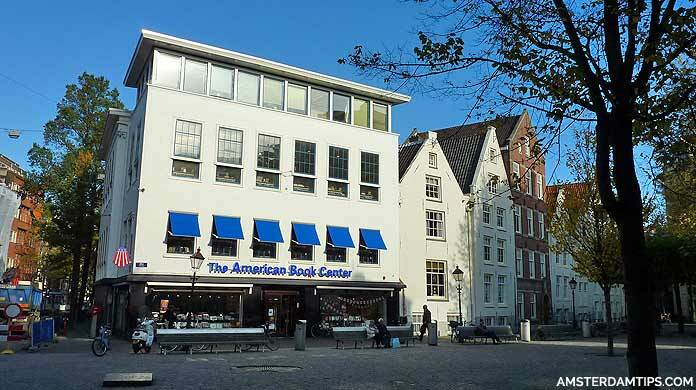 ABC also has a second book store location at Lange Poten 23 in the centre of The Hague. The British bookseller has been present in Amsterdam since 1998. It has a large store covering 4 floors with an excellent selection of titles from the UK. It is located on the corner of Spui and the main shopping street Kalverstraat – quite near ABC – in a listed building designed by prominent Dutch architect Hendrik Berlage. The ground floor covers fiction, current best sellers, local Dutch interest and English newspapers. On the first floor you will find a small range of British food, games, cards and magazines. The second floor has a decent travel section, food and drink, children’s books and sci-fi/fantasy. The third floor includes business, self-help, biography, history and language learning. The friendly staff can help with any requests. There are comfy seats on the top 2 floors to sit and browse – something which the ABC perhaps lacks. There is a nice view over Kalverstraat from the window on the 3rd floor. UK visitors may find the prices a little steep, however Waterstones does have regular offers such as ‘3 for 2’ or ‘buy 1 get 1 half price’. Open daily: Mon (1000-1830), Tue/Wed (0930-1830), Thurs (0930-2100), Fri (0930-1900), Sat (1000-1900), Sun (1100-1830). This is the biggest bookstore in the Netherlands, originating back to 1853. In 2015 it moved from Koningsplein to a 6 storey location on Rokin very close to Dam Square. With a retail area of 3,200m² spread over 5 floors, Scheltema houses over 200,000 books. Whilst catering to the local Dutch market, you will find many titles in the English language. This includes books on Amsterdam on the ground floor, English fiction on the first floor, travel books on the second floor, non-fiction books (health/business/history/psychology) on the third floor and second hand books on the fourth floor. The first floor has a small Vascobelo café – something not found in the other large Amsterdam bookstores. There are plenty of seats around the store for reading and relaxing and a nice view of the Zuiderkerk tower can be seen from the fourth floor. 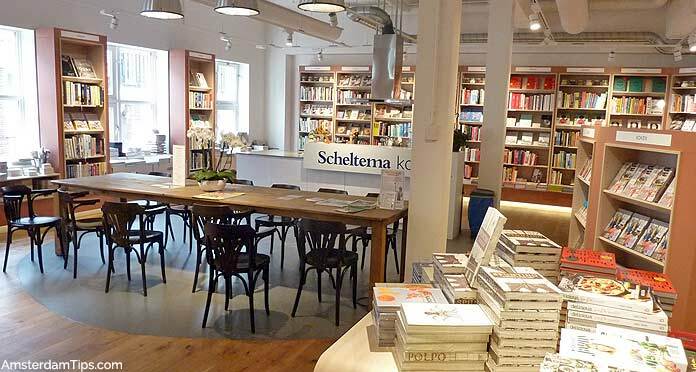 Scheltema hosts regular events such as book readings and signings. We once remember seeing Michael Palin in the previous store location promoting one of his travel books. More recent visitors of note have included celebrity chefs Jamie Oliver and Yotam Ottolenghi. Open daily: Sun/Mon (1100-1900), Tue/Wed/Fri/Sat (1000-1900), Thurs (1000-2100). This shop across the road from ABC specialises in selling a large range of international newspapers and magazines. Athenaeum’s adjacent bookstore also sells some English titles. Open daily: Mon-Sat (0900-1900), Sun (1100-1800). A small cut-price English book outlet on Kalverstraat very near Muntplein. It has a reasonable range of books including travel guides, art books, fiction and non-fiction – you can often find some good bargains in here. Open daily: Mon/Tue/Wed (1000-1800), Thurs (1000-2100), Fri/Sat (1000-1900), Sun (1030-1900). An interesting shop in the Jordaan which sells books (Dutch and English) on alternative health, new age, UFOs, crop circles etc. It also sells a range of vitamins and natural health remedies. Open Tue-Sat (1200-1700), closed Mondays. This is a large specialist travel book shop with an extensive range of travel guides, walking/cycling guides, maps and globes. The inhouse Café Métropole serves drinks and snacks. Located on Overtoom, a short walk from Leidseplein. Open: Mon (1300-1800), Tue/Wed/Sat (1000-1800), Thurs/Fri (1000-1900), closed Sundays. This is Amsterdam’s largest second-hand English book store operating since 1978 located just east of the city centre on the Kloveniersburgwal canal. A one-man business, this independent store has non-fiction and travel books downstairs, fiction upstairs plus a basement with fantasy, psychology and politics. Open: Mon-Sat (1000-1800), Sun (1130-1600).